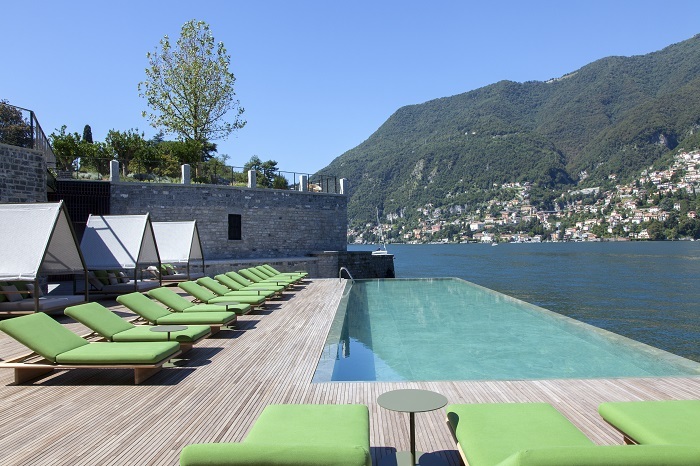 Originally built as the property’s darsena, or “boathouse,” the Spa at Il Sereno has been transformed by renowned designer Patricia Urquiola into a contemporary oasis while remaining reflective of the building’s history and Lake Como destination. Featuring treatments and products by Swiss-based skincare line Valmont, The Spa includes three treatment rooms, sauna and steam room finished with Italian tiles. The location has a private outdoor relaxation area with a plunge pool suspended over the water provides a serene place to cool off and unwind. Keeping in the Sereno Hotel’s tradition of all rooms facing the water; two of the intimate treatment rooms at The Spa at Il Sereno have wall-to-wall, floor-to-ceiling windows that look directly onto Lake Como. The third treatment room is an expansive couples’ treatment room with a built-in shower. Throughout The Spa, the cool tones of the centuries-old granite walls and green accents that reflect the deep tones of Lake Como create an instantly calming environment. Il Sereno has the only spa on Lake Como that features exclusive products and treatments from the acclaimed Valmont skincare brand based just across the border in Switzerland. Valmont is revered for its cellular cosmetics and anti-aging treatments sourced from the natural environment of the country, including pure glacier water from the Valais Glacier.